If we had to pick one character to be in Marvel’s Runaways, it would be purple-haired Gertrude ‘Gert’ Yorkes. 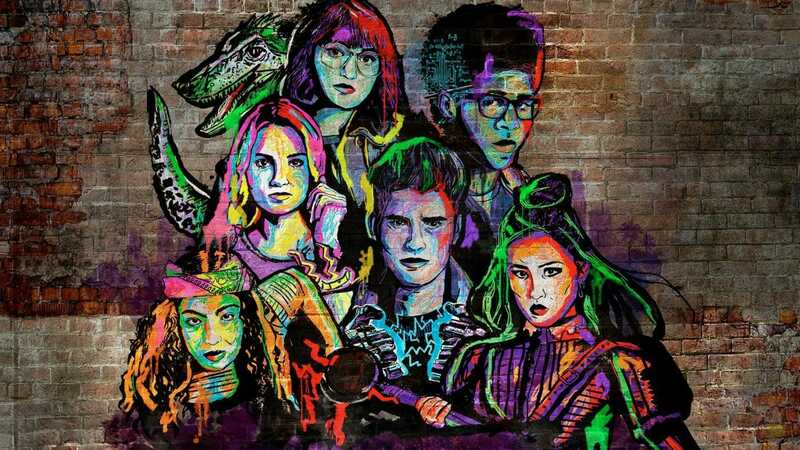 Not just because Ariela Barer is “by far Runaways’ best young actor,” to quote AVClub, but because, duh, she has a telepathic link with her own dinosaur, Old Lace – who is almost like her own therapy dog, but way cooler. It’s a breakthrough role for Ariela, who began her career at age 10 when her manager discovered her at a local children’s theatre group. While she’s appeared in the likes of New Girl (as a younger Cece) and Modern Family, and had recurring roles in One Day At A Time and Atypical, she’s now best known as the fast-talking and quick-witted Gert. Every teenager thinks their parents are evil but Gert’s really are. What’s at stake for Gert this season now that you have all finally run away? What’s at stake is her entire future. She’s someone who always had a bright future ahead of her, and now that she’s on the run, this has all been stripped away. She’s living a lifestyle that she’s not accustomed to. She’s trying to figure out who and what she’s going to become, and maintain these relationships in this new rocky terrain. Gert is a feminist, but she’s also fawning over Chase, this guy who dismissed her. Do you see a contradiction in that? She’s not the perfect feminist who doesn’t need a man. But when I think about my high school experience, isn’t that just what makes us people? These contradictions that don’t really make sense? That’s what makes her a more three-dimensional character. She is really this strong lady – that’s not fake; she’s not phoning that in – but also there is this connection, this history, that is explored, and maybe isn’t all one-sided. She doesn’t need this guy but she’s allowed to want something – she’s not hurting anyone. Tell us about Gert’s struggle with anxiety? This anxiety and this crush is all just incredible nuance that gets to be within Gert and creates this very fleshed out person. It is another element of overcoming something and of subverting the tropes that are established from the first episode. She’s not a one-note feminist; she also has to overcome this stigma around mental health. She’s trying to find pride – “Pride”, ha – in being this feminist who’s allowed to have flaws. You’re acting opposite a dinosaur. Do you find yourself having conversations with Old Lace like she’s a real person? Constantly. It’s really problematic because I forget it’s puppeteers sometimes; I just think she’s a real sentient being. I’ll walk past and say, “What’s up, Old Lace?”, and then remind myself it’s puppeteers and say, “Hi Peter. Good morning. ” She’s amazing, one of the most incredible props I’ve ever seen. There are characters of diverse ethnicity and orientation and personality. No one is alienated when they watch this; anyone can watch this and connect to whoever they want to. The beauty in the amount of representation we have is that no one has to be the perfect representation of each type of person they are – because we have it in abundance, we’re allowed to explore the nuance within it. Does the show encourage teenagers to wage war on their parents? It is a great lesson from both sides. For teenagers to sit and watch and understand the parents’ side for a while. And for the adults to understand how the children feel. It is a great way to bring them all together. I’m pretty content with my life. I guess to further the acting thing, shapeshifting. I could be Daniel Day Lewis without having to do as much. “I need what for this role? Okay, I got it. Here we go.” I’d get every role.